Tan, E. Y. P., & Shoemark, H. (2017). Case study: The feasibility of using song to cue expressive language in children with specific language impairment. Music Therapy Perspectives, 35(1), 63-70. From the day each of us are born, we begin to communicate with others. But as we all grow, our styles and methods of communication begin to vary. For children with specific language impairment (SLI), developing effective communication and verbalization is often achieved through multiple therapies and approaches. The symptoms associated with SLI are not as a result of any hearing loss or other developmental delay; additionally, SLI affects an individual across all language domains, especially in syntax and morphology. In 2017, a small case study was conducted to demonstrate the feasibility of using singing as a tool to help develop speech in children with SLI. Eugenia Yen Ping Tan is a qualified speech-language pathologist and a novice music therapist. 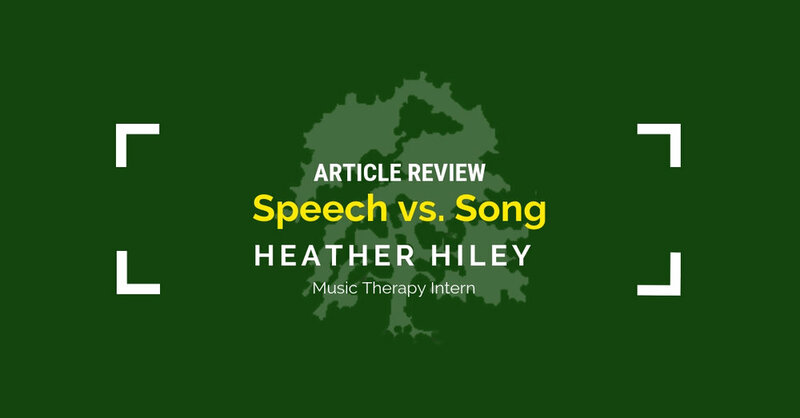 In her observations with Dr. Helen Shoemark, they addressed goals relating directly to the domains of syntax and morphology to compare the use of singing versus speaking to teach verbal communication to children with SLI. While their sample size for this particular study was extremely small at only two participants, their intention with this study was to provide evidence and direction for their audience to consider in future trials and studies. Tan and Shoemark’s rationale in conducting this research has been supported in countless studies: music is relatable, interesting, and has a repetitive nature to it, which is especially important when learning to retain language skills. Especially for young children, keeping them engaged for the duration of an activity is key in finding meaningful results. For this particular study, a boy and a girl, both at the age of 6 years old, were selected from a group of children from a school for those with speech and language disorders. Both participants have moderate-to-severe SLIs and have no other diagnoses. Using the Renfrew Action Picture Test (RAPT), Tan assessed the children and recorded samples of their speech. Tan also used the Language Assessment and Remediation Procedure (LARSP) to assess these samples in greater detail. A total of 12 goals were set to observe the participants’ use of syntax and morphology. The participants then each attended 6 bi-weekly, 30-minute sessions with the first half of each session focusing on syntax and the last half focusing on morphology. For the first sessions, the researcher randomly selected which modality would be implemented in the session, speech or song. The procedure used for every session was a fairly typical 4-step method for helping a child learn to repeat a phrase or behavior. Tan began by demonstrating the phrase, either by speaking or singing, and then invited the client to repeat the phrase in unison with the therapist. The third time, Tan asked the client to repeat the phrase again with the therapist and then would fade out to allow the child to complete the phrase alone. Lastly, the client was to repeat the phrase independently. Throughout this procedure, Tan provided 14 related images to assist in eliciting a relevant response. Using this behavioral approach, Tan also provided preferred activities throughout the session as positive reinforcement. Following the completion of each of the individuals’ six sessions, a post-intervention assessment was administered to observe an overall effect on the children’s language development. These tests showed that both individuals doubled or nearly doubled their initial assessment scores. Overall, this study was able to show that using song to develop speech and language is certainly an acceptable and practical method. However, as was expected, it was not possible for the researchers to determine statistical significance due to the limitations of participants and a shorter time period. In regards to the clinical goals observed in this study, 3-4 syntax goals were met, but no morphology goals were met regardless of the modality used during the session. Tan believes that with a longer trial, we should begin to see the effects of this approach as it relates to morphology. Because of the success in meeting some of the syntax goals, it can be said that using song is at least as effective as using speech to cue in a syntax intervention. Moving forward as a young professional, I look forward to learning more about how to help children develop speech and communication skills in my own caseload. While this case study was small and less focused on the clinical results, there are several points I will be able to take away and use in many of my sessions throughout my internship at The George Center. I especially plan to revisit the 4-step procedure used in this study to help my clients learn and develop desired behaviors and speech patterns. This procedure very clearly and simply outlines how to break down one action to make it easier to teach and to learn. A few of the clients on my caseload tend to have the most difficulty developing morphology skills rather than syntax; for instance, many clients often cannot distinguish between singular and plural forms of words. Based on the suggestions from this study, I am going to explore how the use of music dynamics can help our clients further develop these skills. For those of my clients continuing to develop their syntax skills, I believe that providing strong rhythmic association and implementing the 4-step procedure as they described it will help my clients to further develop their language skills in this domain. I hope to see more studies conducted that go in-depth about all of the language domains and how to isolate them using music interventions.